We have some very talented friends! We were so surprised when we first met our local small business friends, that there was such a plethora of talent behind the closed doors of Wandsworth! 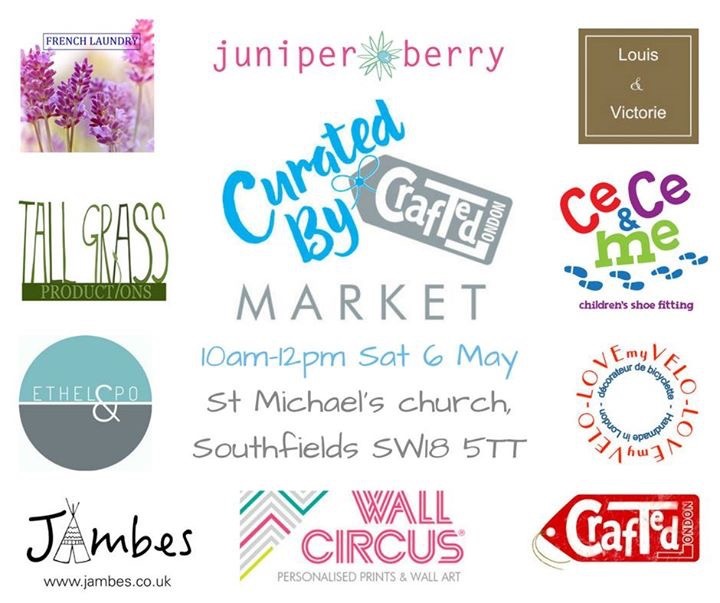 We will be hanging out with some of our new friends at the next Curated by Crafted market and would love to see you there. If you can't make it or just want to keep up to date with our next pop-ups and competitions, please sign up for the Curated by Crafted Newsletter. We've teamed up with our super talented local business friends to put on this Spring Fair. Lots of beautiful things for you to come and look at and you can also grab a coffee in the cafe while you shop. If you have, or know, any little ones, bring them along too as Clare Luther will be reading from her fabulous children's books at 10.30am for story time. We are really proud to be part of a local initiative bringing together small businesses, all helping each other out. We will be working together to put on lots of exciting events in future, but to celebrate the launch of our network and the upcoming Small Business Saturday, we are starting off with a fabulous hamper competition. One lucky winner will win all these fantastic prizes from the members of our network. To be in with a chance of becoming the lucky winner, all you need to do is sign up to the newsletter by Midnight on Friday 2nd December. The winner will then be drawn at random. Terms and Conditions apply, so please check these out before entering. The most frequently asked question at E & P is; Where does the name come from? We explain the origin of the name on the website, but in this blog I thought I'd share the pictures of the inspirations for the name. Ethel, my maternal grandmother. The original superwoman who juggled 6 children, 3 husbands (not all at the same time!) and mostly kept a smile on her face! Po, short for Little Po. A Plymouth Pilot boat which has been the venue for many an adventure on the high seas, well, Chichester Harbour at least! It has been at the centre of many happy days for the whole family; swimming, fishing, eating and general larking! Team GB are total stars at Rio 2016! Bring out your inner Carmen Miranda! Are you ready to channel your inner Carmen Miranda?! Pom pom and tassel micro trend. At Ethel and Po we have already started the run up to Christmas! We have hosted 2 Christmas pop up shops already with 2 more this week and more over the weeks to come! You can come and see us, and lots of other stall holders, at the Christmas Bazaar at Wimbledon Rugby Club (Barham Road SW20) on Wednesday 18th November 6.30pm - 10.00pm. We are loving this necklace this summer. It adds a real splash of colour to your outfit and it hugely on trend with its 'silky' tassle and etched silver plate detail. This month we're loving the orange trend. Our fabulous reversible metallic leather shopper, the fabulous Dahlia earrings and our tassel necklace all add a splash of colour to any outfit. Ethel & Po was born in January 2015 out of a desire to find good quality accessories to brighten up an outfit, without having to stop and think about whether it was breaking the bank.